Frontline health and care staff, patient groups and other experts had the opportunity to contribute views through the 200 events and 2,500 submissions. The Plan committed to giving a third of the extra £20bn the NHS will get by 2023 on GPs, community care and mental health. Mental health is due to get £2.3bn extra of the £20bn, while GP and community care is to get £4.5bn. Page 68 of the plan focuses on Adult Mental Health Services. It states that the plan 'makes a renewed commitment to grow investment in mental health services faster than the NHS budget overall for each of the next five years'. Expansion of IAPT services for people with common mental health problems, with a focus on those with long-term conditions. By 2023/24, an additional 380,000 adults and older adults will be able to access NICE-approved IAPT services. Testing of four week waiting times adult and older adult community mental health teams, with selected local areas in order to set access standards for community mental health services. New models of care for people with 'severe mental illnesses' will include access to psychological therapies, improved physical health care, employment support, personalised and trauma-informed care, medicines management and support for self-harm and coexisting substance use. Inpatient care typical length of stay to reach the national average of 32 days. Ending acute out of area placements by 2021. Improving physical environments. Suicide prevention will include dedicated quality improvement programme to implement the findings from the National Confidential Inquiry into Suicide and Safety in Mental Health in addition to multi-agency suicide prevention plans. Expansion of perinatal mental health services, NHS 111 and have 24/7 access to mental health support. Mental Health Safety Improvement Programme and bereavement support. The use of digital tools ( Global Digital Exemplar (GDE) programme) to personalise care and predict risk. Ambitions for children and young people’s mental health services is on page 50 of the plan. A commitment to investment and faster growth is made, particularly in community-based mental health services, eating disorder services and age appropriate crisis services. There will be new Mental Health Support Teams working in schools and colleges are planned, building on the support already available, to be rolled out to between one-fifth and a quarter of the country by the end of 2023. there will be new services for children who have complex needs, including a number of children who have been subject to sexual assault. The Stopping over medication of people with a learning disability autism or both and Supporting Treatment and Appropriate Medication in Paediatrics (STOMP-STAMP) programmes will be expanded to stop the over medication of people with a learning disability, autism or both. The Learning Disabilities Mortality Review Programme (LeDeR) will continue to be funded and waiting times for specialist services will be reduced. Awareness training and national learning disability improvement standards will be implemented and a 'digital flag' system will be implemented by 2023/24 to ensure staff know a patient has a learning disability or autism. 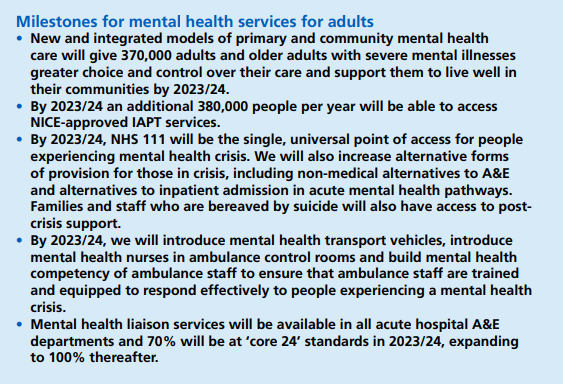 Although it is encouraging to see that mental health is prominent in the Long Term Plan, we remain concerned that there has not been a joined-up plan for NHS and Social Care and staff shortages and other service cuts may undermine its ambition. We would also like to see more focus and detail on standards of care and treatment and the rights of people when on Inpatient Units. Read the NHS Long Term Plan here. The Guardian: What is the NHS long-term plan and can it achieve its aims?